Before you ask, “How do you, the Wandering Wahoo, know so much about opera?” I’ll tell you. My encyclopedic knowledge of opera has been gleaned from watching Jeopardy!, listening to Saturday Afternoon at The Met (sponsored by Toll Brothers), and that time I chatted with the opera queen who was wearing assless chaps outside a leather bar in San Francisco. A long time ago, in a place that existed someplace between Brigadoon and Boalsburg, there was a city-state known as Felicevalle, difficult to reach, but a helluva good time once you got there. Felicevalle was in the far reaches of the Kingdom of Scrivelegno, ruled by the unpopular King Tomaso. King Tomaso ignored Felicevalle, except for the occasional visit to bask in the reflected glory of its gladiators, gorge on fried foods at its fairs, and extract taxes from its hardworking citizens. Except, of course, from those producing gas from Marcellus Shale. No taxes for them. When King Tomaso meets an old crone at Starbucks and hears rumors of unspeakable crimes in Felicevalle, he realizes—before anyone could say double tall soy latte with whip—that his dreams of even more power and fame are within his grasp. The King cackles with glee (the emotion, not the TV show) when he learns that the man accused of the crimes had worked —in the distant past—for his frenemy, the aging Generalissimo Giuseppe Pescapadre, the most famous man in Scrivelegno. Unlike King Tomaso, Generalissimo Giuseppe is beloved by the citizens of the entire kingdom. With affection, everyone calls the Generalissimo “GiuPe”. Months later when the scandal of unspeakable crimes engulfs the kingdom, the Alleged Perp, GiuPe’s long ago protégé, is arrested. As Alleged Perps go, this one is not the brightest footlight on the stage; he mistakenly hires the Village Idiot as his attorney. While he awaits trial, the A.P. is imprisoned in a hut on the side of Felicevalle’s sacred mountain and becomes a subplot in his own story. Seizing his chance to dominate the prosperous but confused city-state, King Tomaso makes a rare appearance at a meeting of the Privy Council of Felicevalle. GiuPe has told the Privy Council that to atone for any mistakes he may have made, he will turn in his sword and return to his farm at the end of the gladiatorial season. The Privy Council does what they do best and discusses who to blame for the scandal, an upcoming Jerry Lewis Film Festival, and where to have lunch. It bows to the King’s wishes and immediately exiles not only GiuPe and but also the not much loved Doge, Gramspan the First. When GiuPe receives the news of his dismissal by carrier pigeon, his wife sings the show-stopping aria, After 61 Years He Deserved Better. Riots ensue when the news of GiuPe’s dismissal reaches the peasants of Felicevalle. The Privy Council installs a loyal functionary as the new Doge, bypassing Felicevalle’s standard Doge search committee process. The P.C. also elevates one of GiuPe’s assistants to command Felicevalle’s gladiators, sending him to an almost certain death in battle. Wait, it’s opera. There is no almost. More is more! The gladiators lose every contest until battle is suspended for the winter. The Privy Council’s ineptitude in kowtowing to the King is exposed and it loses the trust of the citizens. Soon afterward, in a stunning blow to the community, Generalissimo Pescapadre, beloved GiuPe, dies at his farm. Everyone wonders, was it a broken heart, or was he cursed by a witch? The people ignore the possible curse and rise up and show their love of and loyalty to GiuPe with several large production numbers. 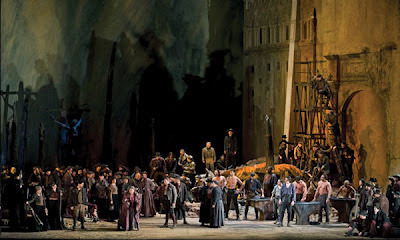 The men and women of the kingdom hatch plans to revolt against King Tomaso and his henchpersons on the Privy Council as the curtain falls on Act One. Quite a lot, eh? Hey, no one said opera was like haiku with music! Act Two opens deep in the forest at Wicked Witch Signorina Vitoria’s cottage made not from candy but from antacid tablets. She casts a spell that causes all firstborn sons in Felicevalle to throw like girls. The townsfolk ignore gladiatorial combat and concentrate their energies on duplicate bridge and the home edition of Project Runway. Beer sales plummet as young men take up drinking chai and vow to save themselves for girls who meet their mothers’ exacting standards. Young women opt for sensible shoes and clothes picked out by their parents. Pilgrims stop travelling to Felicevalle so the sale of lucky charms and trinkets falls precipitously, impoverishing the town’s merchants. Act Two closes with the GiuPe’s successor singing the famous solo, Belichick Never Grunted at Me That There Would Be Days like This. In Act Three, Leecorso Il Bloviatore, the frequently heard but never (well, hardly ever) listened to oracle, finally appears predicting a renaissance for the town. At a nearby gypsy encampment, the townsfolk mistake Brutus the Buckeye for a Yule log and throw him into the bonfire in an Agnes de Mille-esque dance number. Privy Councilors soon fear for their safety and take a page from the Baltimore Colts’ playbook and move to Indianapolis in the middle of the night. 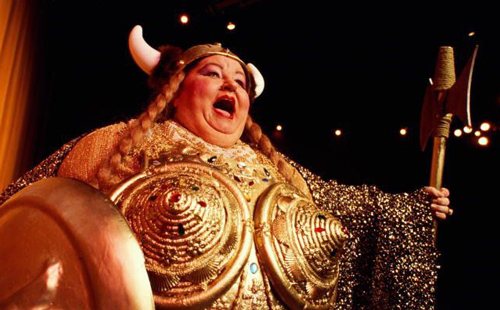 Finally a hefty woman in a breastplate and Viking helmet answers an ad on Craigslist for “Opera Singer Wanted” placed by the town fathers (and mothers) of Felicevalle. She qualifies under Federal nutritional guidelines as a fat lady. Her mellifluous song lifts the various curses and spells and everyone in Felicevalle goes back to living happily ever after. So, are you saying that the sons will not throw like girls after all? This is important. In the meantime and while the city-state is all torches and pitchforks, perhaps the sons should consider embellishing their stab-proof, gladiating Lorica squamata with some identifying crest. At least convert to Roman numerals. Just tying to make lemons into lemonade. I like your positive attitude, D.C.B. In the meantime, I have both torches and pitchforks warmed up and waiting for your next visit. I'm not SWITCHmodern. I'm the Dowager Countess of Bridgehampton. I love your show on Sirius Satellite Radio! 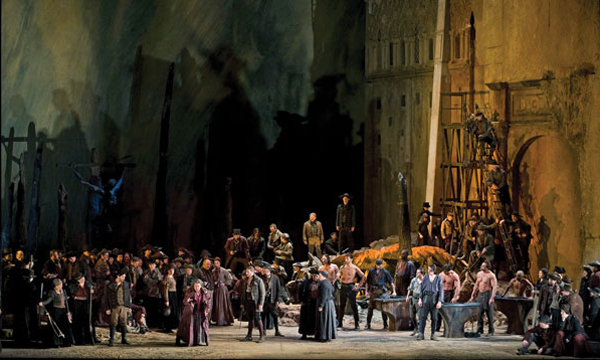 The production would be enhanced by a recurring chorus of townspeople calling out and responding to the cry of "noi siamo . . ."